What changed? I gave my life to Christ. That changed everything. I had lived my life in chaos. I was a millionaire when I was a child. I participated in every form of lust and human degradation. Then 35 years ago, I gave my life to Christ, warts, bruises and all. That has made all the difference. Amazing! I love stories like that. I’m sure you’ve heard similar stories through the years. A person’s life is a mess, they find Jesus and turn their life over to him, and they begin a “new life” altogether. Our reading from Acts today shows us how God in Jesus can change us; and not just that, but can call us to do things we never would have dreamed we could do! 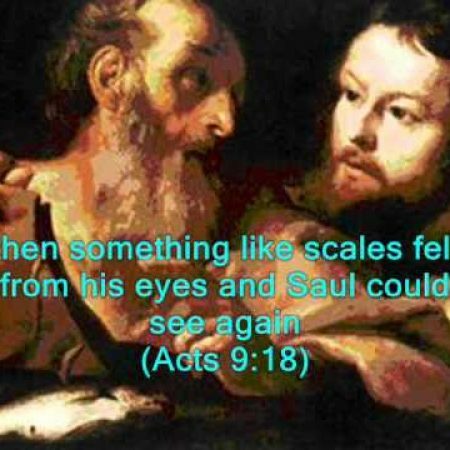 The first time we hear of Saul in the Bible is two chapters before this reading, where we find him holding the coats of his friends while they were stoning Stephen to death. And very quickly Saul moves from being a willing bystander to becoming an active persecutor of Christians. Saul is on a search-and-destroy mission and his target is Christians. And he’s certain that he is carrying out God’s will – remember he is a faithful Jew and high up in the hierarchy of Jewish elites. He is a theological authority, conducting investigations, holding court, helping to make Israel safe for God by removing these outliers who follow Jesus. Today we call changes like this conversion. And here’s what we learn from Saul’s conversion: There is nothing that you can do to make it happen. It is what God does to you, in you, and for you. We are the recipients of God’s grace and it changes us. However, it takes many shapes and forms…we won’t all be knocked off our horses. Because God relates to us as individuals, conversion – being changed – will be different for each person. But here’s what’s the same: When Jesus comes to us, when God changes us, we will find ourselves doing things we could never have imagined. AND God will be with us every step of the way. Consider Ananias. Nobody really remembers him. The Lord didn’t blind him with a bright light. The Lord didn’t change his name. As far as we know, the Lord didn’t send him to faraway places where he would suffer floggings and imprisonments. The Lord did not give him an assignment to change his world so that our world would still be reverberating from the impact. But the Lord did give Ananias an assignment to change the world for one person. And it’s the same for us. You and I may never be asked to change the world, but we may be asked, from time to time, to change the world for one person. You see, while we don’t know a lot about Ananias, we do know that he was a disciple of Jesus. Saul and Ananias couldn’t have been more different. And they have two very different encounters with Jesus. Isn’t it interesting that God will come both to those who recognize his voice, and to those who don’t…to those who are walking the path of discipleship faithfully, and to those who are resolutely walking the wrong way entirely. If you think you have to get your act together before Jesus will consider calling upon you, think again. Sometimes it is actually Jesus’ call that lets us know that we don’t have our act together. But know that, as followers of Jesus, He will continue to call upon us to change the world one person at a time for the rest of our lives. So what does that call look like? Well sometimes when the Lord calls us, He’s calling us to wait. When Jesus confronted Saul on the road to Damascus, he gave Saul one instruction: Get up and go into the city, and you will be told what you must do. The men with Saul led him by the hand into the city, where for three days he could see nothing. He ate and drank nothing. He waited, and he prayed. During this time he received a vision that a man named Ananias would come and place his hands on him to restore his sight. And he waited some more. God had a tremendous task to set before Saul – be his premier evangelist, launching the first generation of churches – but his first task was to wait. Other times, when the Lord calls, the next thing you have to do is go. When the Lord gave Ananias his assignment, Ananias asked a big question: Lord, I have heard many reports about this man and all the harm he has done to your saints in Jerusalem. And he has come here with authority from the chief priests to arrest all who call on your name. Are you sure this is the man you want me to go see? Which was the case with Ananias. What he was being asked to do – to go heal Saul – is the same as a Jewish Rabbi being asked to go heal Hitler. He was understandably concerned! But God said ‘go’ so he went. Sometimes when the Lord calls, it will turn your life upside down and nothing will ever be the same again (Saul). Sometimes when the Lord calls, it is simply time to do your task and then to return to your life (Ananias). Either way, when the Lord calls, he often calls us to something we never could’ve imagined. And as you know, not all conversions are sudden like Saul’s. While some are blessed with a sure and certain moment, others are blessed with a series of more subtle turns and affirmations of God’s grace in our lives. Sudden blinding lights are rare, and my guess is that most of us have experienced a series of conversions that have sustained us over time, rather than a once and sudden event. If you ask when IT happened to me…. It happened over the course of my childhood as I grew up year after year going to Sunday School week after week. It happened when I was confirmed in the 10th grade and no longer HAD to go to church, but wanted to go anyway. It happened in college when we had a family crisis and I left the faith only to see that it is God who sustains life and brings hope to hopeless situations. It happened when I was 25 and realized one day that no matter what happened or where I went, I would always be proud to be a Christian. It happened a few years later when I was so sad that I stopped going to worship for several months confident that God was patient and that I’d feel His love again when I came through on the other side of my sadness. It happened when God granted me courage and strength to do something I never thought I could do. If you press me to give you a date and location of my conversion – I’d have to say 2,000 years ago on a hill outside Jerusalem. Jesus’ death and resurrection is what changed me, and continues to convert my heart daily from a selfish, inward focused life to a hopefully Christ centered one. After the sermon we will sing the beloved hymn, Amazing Grace written by John Newton. His story is interesting… Brought up in rough circumstances, Newton became the captain of a slave trading ship. He drank hard, he worked hard, and he hated with a passion all things Christian, all things he saw as weak, and that would get in the way of his wild living. But then after years of self-loathing and hating others, he had a moment on a ship, in the midst of a terrible storm, when he cried out to God and believed afterward that God heard him and saved them. From that moment on, he had an openness to the gospel and to God’s leading in his life. And while he celebrated the date of that storm, May 10, 1748, as the moment of his conversion, he also said this: I cannot consider myself to have been a believer in the full sense of the word, until a considerable time afterwards. Sixteen years later he became a pastor in England and enjoyed many decades as a pastor and hymn writer. to preach the faith he had so long labored to destroy. When the Lord comes to us, whether by stopping us in our tracks, or by nudging us toward a new direction, we are changed. And when we are changed, so is the world around us – one person at a time.